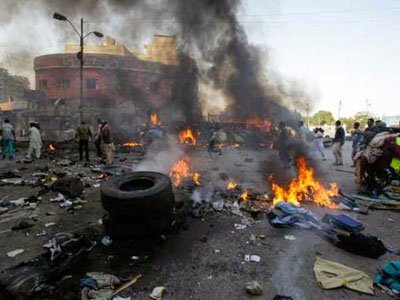 No fewer than twenty persons have been confirmed killed after an explosion in Damboa Local Government Area of Borno State, according to Channels Television. The report revealed that the explosion is suspected to be an attack by suicide Boko Haram bombers. The sad incident took place while villagers in Abachari town, in Damboa Local Government Area, were observing the Eid-el-Fitri celebrations when the explosion occurred on Saturday evening. The attack was confirmed to Channels Television by Borno State Police Commissioner, Damian Chukwu. “At about quarter to nine, yesterday night, a loud explosion was heard at Abacahri village, along Damboa/Chibok road. The DPO mobilised with our men from the SARS and civilian JTF to the scene and found twenty people dead and 48 others injured. “Some of the bodies were found chattered, indicating that the explosion came from an explosive device,” Chukwu said. Chukwu said further that the police is yet to confirm if the explosion was as a result of an Improvised Explosive Device (IED) or a rocket-propelled grenade. The injured persons have since been rushed to Damboa General hospital while some others were conveyed to the Teaching Hospital in Maiduguri for specialists’ attention. The Commissioner of Police disclosed that the number of victims is on the high side because most of them were returning from celebrating the Eid-el-Fitr holiday when the attackers struck. The military, however, said the attack was carried out by suicide bombers. Theatre Commander, Operation Lafiya Dole, Major General Rogers Nicholas dispelled rumours suggesting that the explosion was from military artilleries. He said six suicide bombers were responsible for the explosion. He, however, assured that the troops are on the ground to stabilise the affected area and forestall any further untoward occurrence. National Emergency Management Agency (NEMA) disclosed that twelve out of the injured are in critical conditions while the United Nations Office for the Coordination of Humanitarian Affairs (OCHA) is organising a chopper to evacuate them to Maiduguri, the Borno State capital.